National Chairman of the All Progressives Congress (APC), Comrade Adams Oshiomhole said Friday that Benue State that the exit of Benue State Governor, Samuel Ortom from the party was a blessing in disguise to the APC, saying his three and half years as governor in the stage was a waste as he had no single project to show for the mandate given to him by the party. Addressing a news conference at the party secretariat, Comrade Oshiomhole said even though the party leadership had attempted to wade into the conflict between the governor and leaders of the party in Benue State, he could not successfully defend the weighty allegation leveled against him by the leaders of the party in the state. He said that at the instance of the Governor, the National leadership of the party had arranged another meeting to bring north Gov. Ortom and party leaders in the state to a round table with the meeting scheduled to hold on Wednesday, July 24 only for the governor to turn governance to “nollywood”. 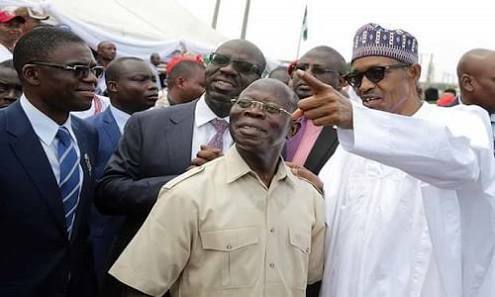 Oshiomhole said “Within the last 48 hours we have watched the unfolding events in Benue State particularly the decision of Gov, Ortom to leave the party. Ordinarily, we would not have responded having already responded to the decision by the Publicity Secretary. “As you all recall, Gov. Ortom had said that the APC in Benue State gave him red card to leave our party and that they will not field him in the governorship election in 2018 and that because the door had been shut against him, he had no choice than to leave. Without going into investigations, we invited him to speak to us on the issues and we also invited our party leaders in Benue State to also brief us on what the issues were. “From the point of view of our leaders in Benue State, their position was clear that field Gov. Ortom On APC platform in 2019 can only lead to electoral defeat for a number of reasons. “They reminded us that inspite of the allocation accruing to Benue State, the bail our fund amount to over N20 billion and the huge sums of money collected from the Paris club refund, he was not paying salaries to Benue workers, including teachers, local government employees and civil servants. He owes some of the as much as 12months salaries.